Spring is Here – Refresh, Reboot! SPRING! A time to clear away the blahs, to reassess goals, to clean out closets! Here in Guam it is an endless summer (which may sound great to a lot of you!). however, the weather can be a motivation killer. That “sameness” is kind of what has happened with me lately. The lack of a season change made me a bit stuck with my mindset and goals. Not necessarily a bad thing, but I noticed that I hadn’t written anything in awhile or planned something new. So – presto! Presenting the new look to The Divine Mz M! I am back, baby! New beauty tips, reviews, fashion, fitness, body image discussions….and GIVEAWAYS! Yes!! What are you planning to do differently this spring? I’m going to get more fit (planning on 15 more pounds gone by my July birthday), focus more time with friends, and saving cash towards a December trip to Australia! I would love to know your goals! Fast Fashion Retailers – Many are My Favorite! Trendy, of the moment, affordable style? Sure, sign me up. Stores like these are super attractive for a fashionista like me. 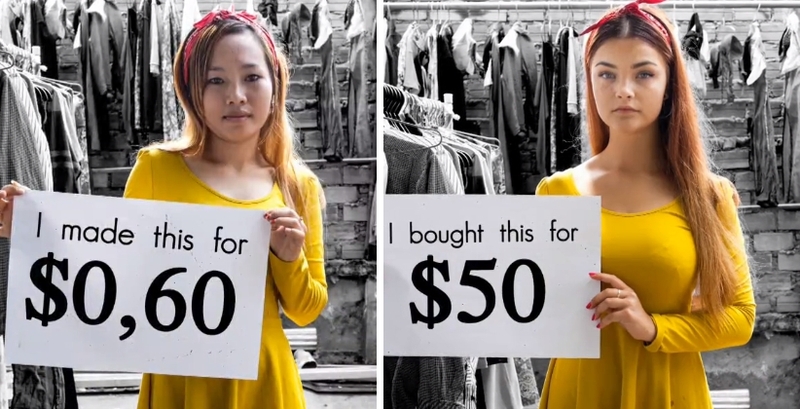 However, today my view of fast fashion has drastically changed, due to a documentary called The True Cost. This film showed me how my pursuit of a $8 top is at the cost of workers in Bangladesh, China, India, and Cambodia. Many of these workers are in dangerous working conditions to keep the costs of manufacturing low. In 2013, a large building collapsed in the Rana Plaza where much of the garment industry is centered. 1,100 workers died as a result of factory managers neglecting the deteriorating conditions of the building. This event is just one of the tragedies at garment factories in these areas. Not only are people being affected by the low wages and dangerous working conditions, but our environment is taking a hit by the use of pesticides on the cottons used in the material. Dyes used for leathers in India are full of chemicals, which end up leaking in water supplies. Most of these women make just $3 USD a day. I don’t want to preach to others that they shouldn’t buy from our favorite retailers, but maybe we can slow down how much we buy. Maybe we can recycle more of our clothes. Maybe we can give our business to more fair trade retailers and designers. My mission now is to profile fair trade brands and also show looks I created from secondhand stores. I hope you will join me! Let’s share our fair trade and recycled looks! March-ing Forward into Spring Style! Victoria Beckham and Gucci lead the charge using these types of photo prints. Gucci also brought more embroidered silks to the runway. Gorgeous!! Though DKNY and Calvin Klein stuck to mostly a black and white palette, I do love the mix and match of separates offered. Michael Kors also showed lots of jersey dresses and wrap skirts. Too many times, a designer will create a look that only works with EVERYTHING shown. We need mixing options! Glad to see these designers understand that! 3. Fashion REAL women can wear. Fashion should be fun and have an element of fantasy. However, we still need to be able to wear clothes for work, weekends, etc., AND should be “wearable” for women of all sizes. Carolina Herrera’s show offered several looks which work for real life and for women over a size 4. She showed many skirt/top combinations and dresses which emphasize the waist and hide possible problem areas for women. Of course…we don’t all have the budgets to afford looks off the runway, but we can get inspired and find style that won’t break the bank! I did a wardrobe purge and freshened it up with new pieces from Forever 21 Plus. Love the sunset in the background! Are there looks you’re loving for Spring? Please share! Can you believe it’s February?!! It’s the season for love, and I’m focusing on new looks I love! The first I’m loving is the new collaboration between Target and the editorial site, Who What Wear. I’m applauding that Target is understanding that we curvy gals need modern, basic pieces at affordable prices. I love Elloqui as much as the next gal, but my budget allows only sale items from them. With Target X Who What Wear, I can get basic tees, jeans, work -worthy tops and skirts all under $40. I need that trench in my life. The collection isn’t flashy at all, but it is sharp and can be mixed easily with lots of pieces, which is what we all need, right? Thanks to Marcy Cruz at Plus Model Magazine for turning me on to this collection! I write this post with a heavy heart. One of my all time favorite musicians and fashion rule breaker is gone. David Bowie left us with an amazing body of work that spanned over six decades. He was an artist in every sense of the word. An actor, director, performance artist, writer, singer, and musician who challenged the norm. Some knew him as Ziggy Stardust, Aladdin Sane,The Thin White Duke, The Man Who Fell to Earth, Major Tom, or for most 80’s kids – Jareth, the Goblin King from Labyrinth. The Many Faces of Bowie. David Bowie had an uncanny way of understanding that music and fashion influenced one another. With each new album, he unveiled a new look, a new source of inspiration. Unlike many artists, his concepts always worked because they were authentic. Nothing ever appeared to be created by a manager or a record company. Bowie controlled his look and sound, right to the very end. As someone who came of age in the 1980s, his Let’s Dance album is when I grew to appreciate him as a musician. His haunting “China Girl,” the groovy “Let’s Dance,” and rocking “Modern Love” played constantly in my room. I was fascinated by his earlier work, especially “Ashes to Ashes” (the video was SO WEIRD to me – I understood it later on), “Fame,” “Fashion,” and one of my all time favorites, “Changes.” He was one of the first pop artists to play with gender bending in the video for “Boys Keep Swinging,” which for most pop stars could have spelled the end of a career. Not for Bowie. He knew how to push an envelope and still make a point. “Ashes to Ashes” sad clown. During the early part of his career, some dismissed Bowie as bizarre, a flash in the pan looking to make headlines. They couldn’t have guessed that he would release an album on his 69th birthday, Blackstar. Despite fighting cancer, he would his say in his music. There will never be another David Bowie. With his wife of 20 years, Iman. How was your holidays? As soon as we’re winding down from all the shopping, wrapping, travelling, and eating (! ), it’s time to usher in a new year! I’m starting off 2016 with a new look! Behold my PURPLE hair! I decided it was time to do something bold and I LOVE this color! But why am I wearing a scarf when I live in Guam? Well, the Hubby and I decided to take a week long vacay to Seoul, South Korea for Christmas! We got a taste of winter like temps (without the snow) and experienced true Asian culture for the first time. Look at the size of that rock! Korea is well known for fashion, cosmetics, and yes – amethysts! One of the places we stopped at during a tour is a amethyst jewelry factory, and for a fraction of what we’d pay in USD (likely around $700), I had a custom made ring created for under $300! Merry Christmas to me! One of the sites I enjoyed the most was going up in the Seoul Tower. Although the journey begins with a LONG line to get into a cable car to the site, it’s so worth the view once you get to the top. Our timing was perfect since the sun was beginning to set, creating a gorgeous view over the city. I also loved the windows of the Tower. Cities of the world wound around us, and I was excited to find a window with cities we’ve visited! Hello Berlin, Paris, and London! What a cute coffee! Almost a shame to drink it! Of course, I need to talk about the COSMETICS AND SKIN CARE! However, that is going to be in my next post because I went on a huge buying spree, and there’s LOTS to share! What are YOU wearing for New Year’s Eve? I rocked a black jumpsuit, a sequined Calvin Klein jacket, and Dereon glittery booties for a Christmas party. This look would be fab for NYE as well!